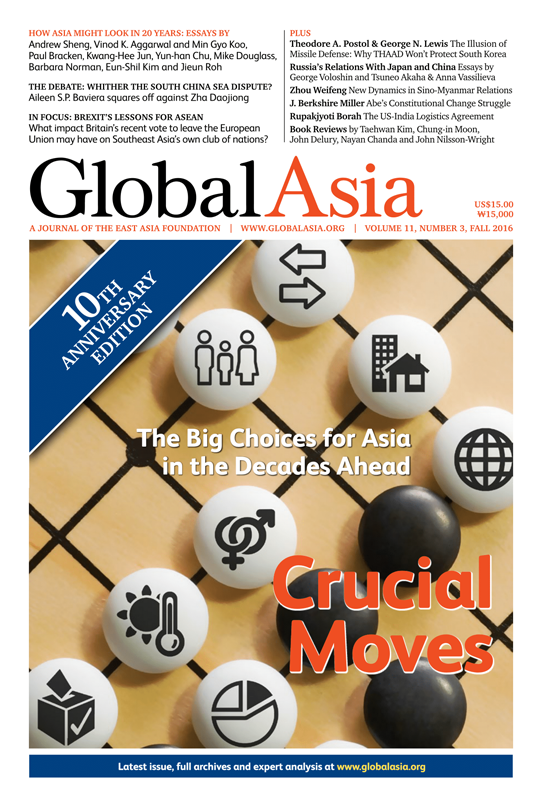 Welcome to this anniversary issue of Global Asia, which marks 10 years since we launched the journal. A little more than a decade ago, in late 2005, a small but distinguished group of Asia specialists from around the world gathered in Seoul under the auspices of the East Asia Foundation to plan an ambitious, long-term project: a journal on international affairs, based in Asia, that would provide a forum for Asia to speak to the world, and for the world to speak to Asia. Like so many other products from Asia in the decades after the Second World War, it was conceived initially as a copy of a Western model – the Foreign Affairs of Asia. But like so many other products from Asia, Global Asia has evolved into something unique in its identity, relevance and value. Asia continues to be the world's most dynamic region, and we believe in the decades to come, it will play an increasingly pivotal role in world affairs, for better and worse; Global Asia intends to be there to chronicle and analyze that story. What a difference 10 years can make. When Global Asia launched in September 2016, neither the iPhone nor the iPad existed. Osama bin Laden was still alive, and so was Michael Jackson. Twitter was introduced two months earlier, while one month later North Korea conducted its first nuclear test. Neither Barack Obama nor Xi Jinping was in power. The global Great Recession triggered by the mortgage crisis in the US was two years away. No one could have predicted the return to power of Shinzo Abe in Japan in 2012, the 2014 military coup in Thailand, the reforms in Myanmar that would lead to the political resurrection of Aung Sang Suu Kyi and the political changes in India wrought by Narendra Modi. No one could have imagined the emergence of Donald J. Trump as a possible future US president. And who would have thought that the Philippines would take on the region's rising power, China, at an international arbitration panel over a maritime dispute in the South China Sea and win? Perhaps the only reassurance in the decade since Global Asia launched was that the world didn't come to an end when the Mayan calendar concluded its latest cycle in 2012. Today, we face a North Korea that just conducted its fifth nuclear test and has developed numerous enhancements to its ballistic missile technology. In response, South Korea is on the threshold of accepting the deployment on its soil of America's Terminal High Altitude Area Defense (THAAD) system, a weapons system with radar capabilities that have rightly provoked deep concerns in Beijing. Japan under Prime Minister Abe is pushing forward with efforts toward constitutional and other reforms that could rewrite the pacifist assumptions that guided Japan's international posture after the Second World War, perhaps paving the way for Tokyo to assume a more active role in regional affairs, and even regional conflicts. Meanwhile, countries throughout the region, including those in the Association of Southeast Asian Nations (ASEAN) and India, continue to build their military capabilities in an arms race that underscores a growing sense of insecurity throughout the region. Meanwhile, Asia's mega-cities – the largest and most numerous in the world – swell with migrants from rural areas and even foreign workers, challenging existing systems of urban governance and leading to calls for more progressive and inclusive forms of governance. Add to that Asia's enormous demographic challenges – with some countries experiencing staggering rates of population decline and aging while others, such as India and Indonesia, experience a surge in young people – and it is clear that the Asia of 10 or 20 years from now will be nothing like the Asia of today. Add to this the expected inclusion of a greater proportion of women in Asia's rapidly growing workforce, and it becomes clear that it is fiendishly difficult to predict what Asia's future will be. Even areas such as trade, which has played such a vital role in the region's growth for the past 70 years, are undergoing major shifts in patterns of development, while long lasting assumptions about what constitutes normal economics in Asia are being uprooted by the emergence of a "new normal." And lastly, the future of democracy, legitimacy and governance in Asia are far from clear, as the region evolves models of governance that are testing values long promoted by the West. Despite the enormous challenge of predicting the future of a region where change is the norm, we asked the authors of the cover package for this 10th anniversary edition of Global Asia to try to imagine what Asia might look like two decades from now. We knew this was an impossible task, and one that would expose them to debate now – and in 20 years' time – because no one can accurately see the Asia of 2036 from the vantage point of today. Still, we felt it was an exercise worth undertaking, and we are grateful to our contributors for giving it a go. The result makes for fascinating reading. No anniversary such as this for us at Global Asia should pass without saying thank you - to you, our loyal readers; to our numerous contributors from dozens of different countries and institutions spanning the entire globe; to our editorial board; to the members of our board of international advisors; to our regional editors; to our publisher, the East Asia Foundation; to our advertisers; and finally, to the Hyundai Motor Group, without whose support we could not have thrived as we have over the past decade. Thank you. Who can say what Asia might look like in 20 years’ time? No one with any real degree of certainty, but the events and trends of today give pointers. North Korea’s continuing nuclearization, military build-ups around the region, Japan’s probing constitutional reforms, swelling mega-cities and shifting demographics across Asia — all are examples of changes under way that will see a dramatically different Asia in coming decades. Five linked mega-trends signal the old order is passing, a new emerging. It has served well but is not assured. The build-up of military capabilities among major powers in the regionis a major concern. The next 10 years are critical. Young Asians value what political systems deliver more than their underlying principles. A move is needed from corporatized cities to urban centers characterized by inclusive, progressive governance. Efforts at the urban, rural and national level can help alleviate a future of violent weather, coastal flooding and food shortages. Women still face violence and discrimination. Whither the South China Sea Dispute? Amid Political and Practical Uncertainty, What Next? It is in Beijing’s and Manila’s strategic interests to come to an agreement. Basic principles of law should also be considered. A drastic change in the Chinese mindset is required to accept that the South China Sea is a shared resource vital to many nations. Shinzo Abe’s longstanding interest in changing Japan’s US-scripted constitution is a perennial worry for those who sense danger. Moscow is “looking east,” and this could include closer ties with Japan, if both sides are creative and engaged. Once Myanmar’s closest ally, Beijing has had to adjust to a diminished role, but relations remain close for both countries economically and strategically. Deployment in South Korea could heighten tensions in East Asia and beyond without really enhancing security. Russia and China are closer but also competing, and Russia is losing. But will this be a boon to either side? Closer military ties between the two powers show Prime Minister Narendra Modi’s willingness to move relations to a new level. The UK’s surprise vote to leave the EU has cast doubt on Europe’s future and triggered reflections on ASEAN’s accomplishments and prospects. With the EU seeking free-trade agreements with individual ASEAN countries, the UK vote throws negotiators a fresh challenge. Andrei P. Tsygankov’s Russian Foreign Policy: Changeand Continuity in National Identity is intellectual refreshment for those bored with realist power logics prevailing in world politics.